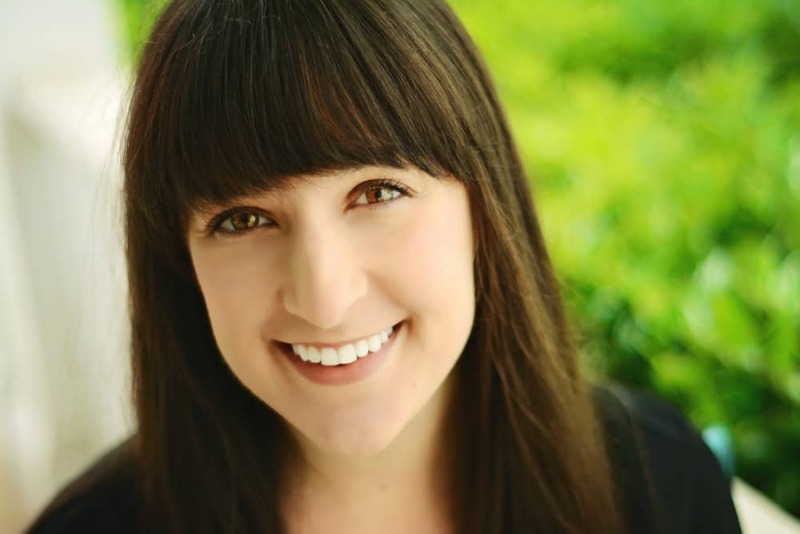 March 24, 2016 By Liz 38 Comments Note: This post may contain affiliate links. It’s no secret I love my spiralizer. While I’d never give up pasta forever, zucchini noodles are a nice way to get in some extra veggies. My only pet peeve with veggie pasta is that it can be a bit watery. While I love eating this spaghetti swap, I wanted a zucchini noodle recipe that wouldn’t be quite so soggy. So I’m sharing a delicious zucchini noodle recipe and my tips for avoiding watering zucchini noodles. One cause of soggy zucchini noodles is the tomato sauce. All that liquid combined with the moisture in the zucchini noodles means you end up with a bit of a soup on your plate. Of course, I couldn’t give up tomatoes entirely. So I decided to roast them in the oven for maximum flavor without extra moisture being added to the dish. Don’t overcook the noodles, otherwise, they’ll get soggy. I like mine to have a slight crunch, sort of like al dente pasta. 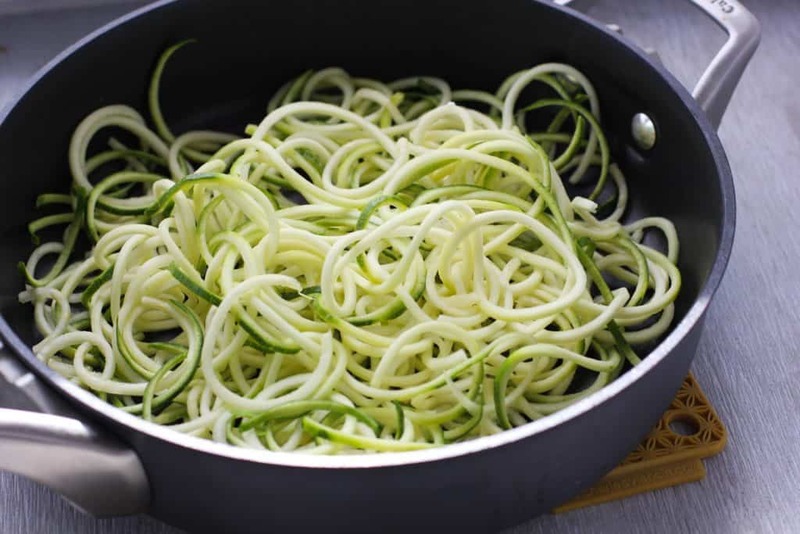 After spiralizing your zucchini noodles, sprinkle with a bit of salt and let them sit in a colander for 10 minutes. It’ll help get rid of some of the excess moisture. If I’m short on time, I’ll skip this step but it does seem to help! After resting, pat them down with paper towels. Get rid of the “seedy” noodles. These strands come from the very center of the zucchini and they have a high water content, which can make the rest of your strands soggy. Roast your tomatoes long enough to remove the moisture. Again, if you’re short on time you could skip this step and use jarred sun-dried tomatoes. Just make sure your getting rid of the moisture from the tomatoes so they don’t make your final dish too wet. Side note: how cool is this colander? It nestles right in the corner of the sink! Alex got it for me for Valentine’s Day! The man knows how much I adore kitchen accessories. It’s perfect for draining my zucchini noodles so I can still use the sink. Once my zucchini noodles have drained for a few minutes, I saute them for just a minute or two. Be sure not to overcook them! When the zucchini noodles have just started to soften, I drain any moisture in the pan, then toss them with the cheese. Once the noodles are coated in cheese, I add the tomatoes and a sprinkle of parmesan cheese. Dinner is served! This recipe turned out so well- it might be my new favorite way to eat zucchini noodles! I like to shred my cheese with a microplane so it’s super fine and it coats the noodles evenly. Try one like this! Avoid soggy zucchini noodles by following my tips and enjoy these deliciously cheesy noodles, instead! Slice the cherry tomatoes lengthwise and spread them out on a baking sheet. Drizzle with olive oil and pop them in the oven for 25 minutes or until they’ve shriveled up a bit. 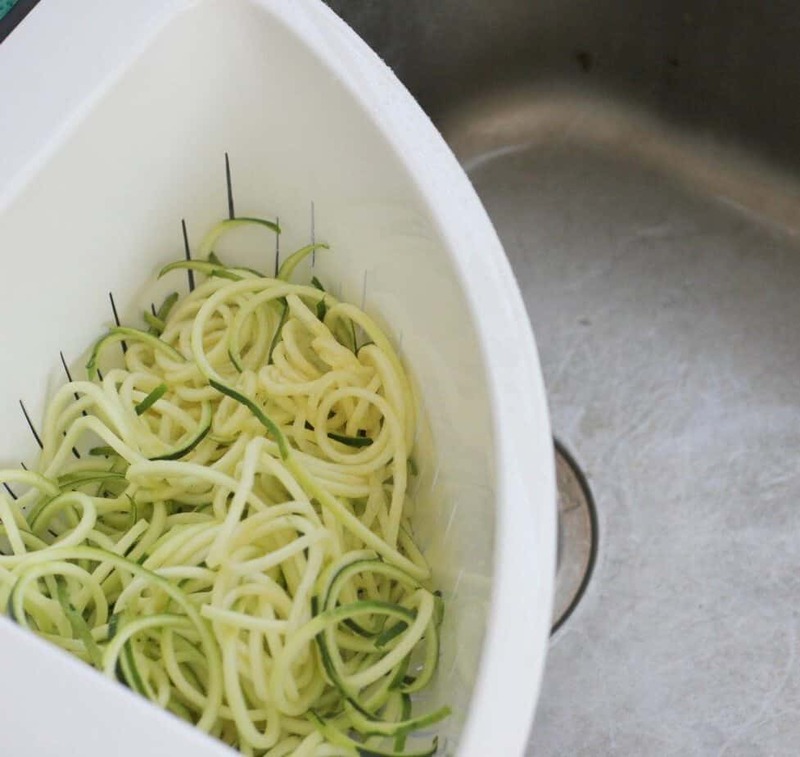 If using a spiralizer, slice the ends of the zucchini off so you have a flat surface on each end. Spiralize into strands, cutting them every 6 inches so they don’t get too long. If you don’t have a spiralizer, you can achieve the same effect with a mandoline slicer or even a vegetable peeler. You’ll want to shave the zucchini into thin ribbons. Discard the “seedy” strands. These strands come from the very center of the zucchini and they have a high water content, which can make the rest of your strands soggy. 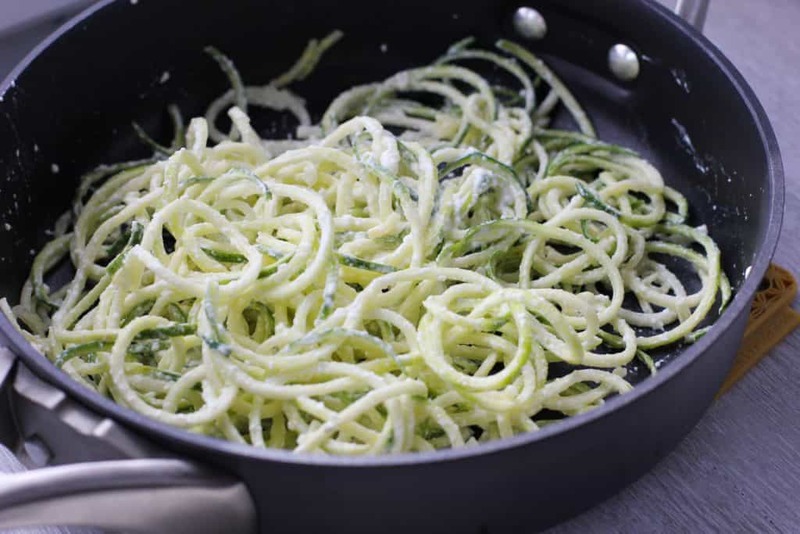 After you’ve spiralized or turned your zucchini into ribbons, sprinkle them with a bit of salt and let them sit in a colander for at least 10 minutes. This will help get rid of some of the excess moisture. To cook them, saute them in 1 teaspoon of olive oil for a 2-3 minutes over medium heat. Be careful not to overcook them or they’ll become soggy. Drain any excess moisture that may be in the bottom of the pan. Once the zucchini noodles are cooked, stir in the ricotta cheese and toss until coated. Once the tomatoes are roasted, combine them with the parmesan cheese, and red pepper. If you follow these tips, you’ll have deliciously cheesy noodles without any soggy texture! And just look at how deliciously cheesy and creamy they are! If you love Parmesan, you have to give this a shot. Make sure you use a high-quality cheese. I used fresh Parmesan and it makes all the difference! The cheese really shines here and you don’t have to worry about soggy noodles! Looking for more healthy noodle ideas? 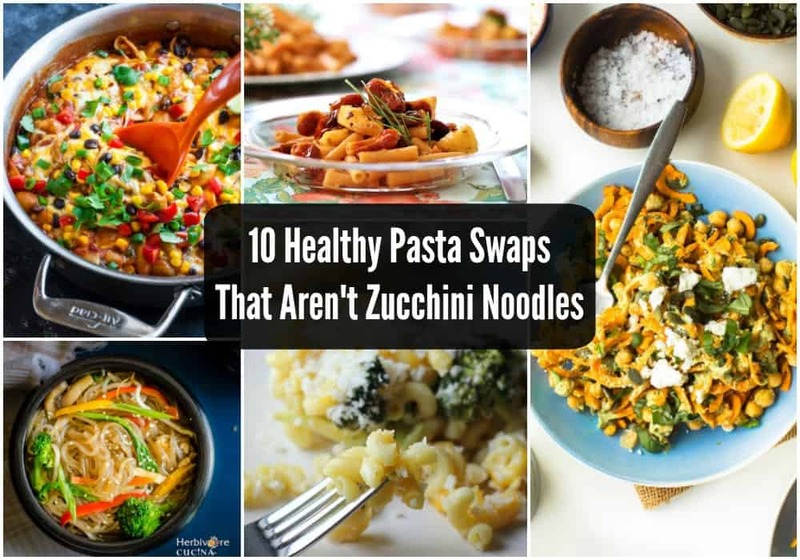 Think beyond zucchini and try one of these healthy pasta swaps! 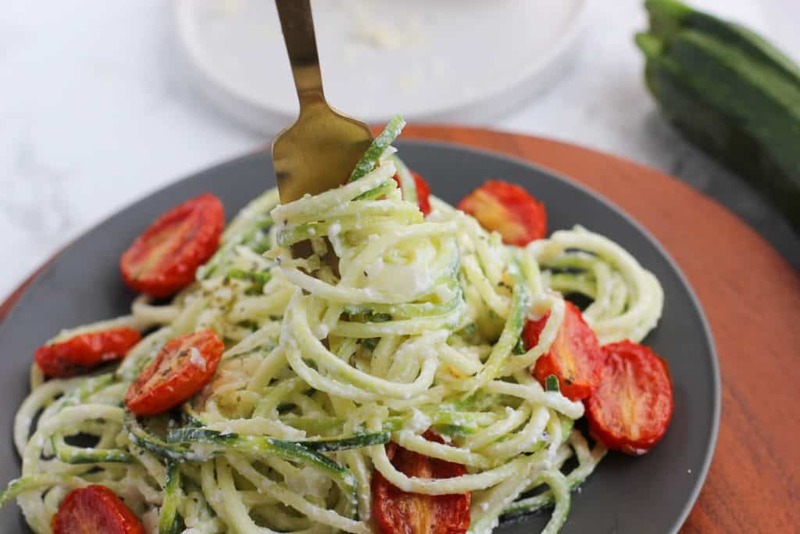 What’s your favorite way to eat zucchini noodles? And this is the reason I go for spaghetti squash over zoodles 98% of the time. I’m gunna have to try your tricks now though. Thanks for sharing! Totally need to try the salt trick. I love how fun spiralized veggies are! Also, huge fan of the super simple recipe. 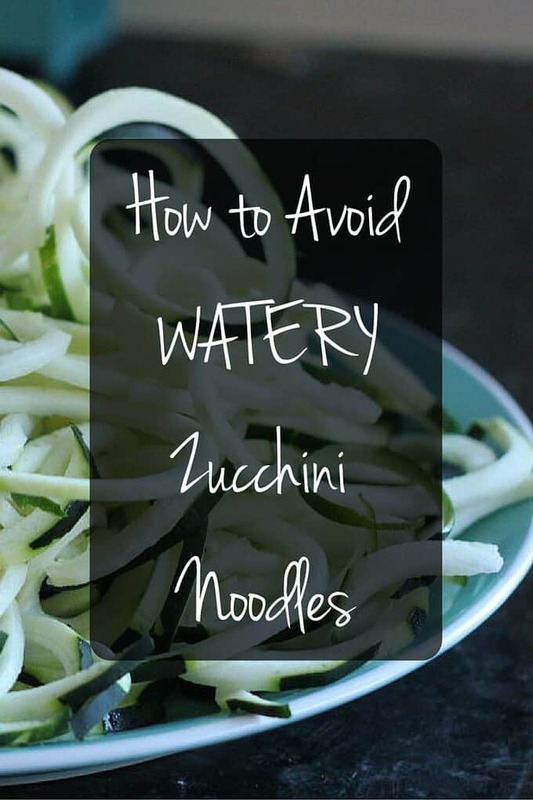 Delicious and great tip about preventing watery noodles! I need to get a friggan spiralizer!! I know, I know! Late to the party. That looks so good! I love roasted tomatoes. I haven’t quite figured out a way to replace my pasta that makes me happy, so I’ll have to try this one out! 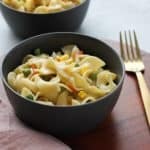 I have never tried vegetable noodles, so I am very excited to try your recipe! I’ve been wanting to try zucchini noodles and this just makes me want to try them even more! I like the tip about salting the zoodles, but I would aedd that it is best to gently towel them off after that – works wonders. We’ll have to try this. I hate soggy noodles, so we typically run ours though the salad spinner first. I have been obsessed with zucchini noodles lately! They make an appearance at every meal and I’m quite alright with that! My favorite topping right now is pesto! 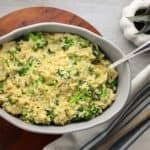 I’ve been trying to find a good vegetable noodle recipe, thank you for sharing. I hate soggy noodles. Love the colander! I actually hate zucchini (ha) so I never eat it. These look Yummy! I love all the tips for the zoodles too 🙂 Thank you for joining the Sunday Fitness & Food Link-Up. Pinned & Yummed!! Thank you for sharing that! I love zucchini and grow so much of it every summer but that is the one trick I haven’t learned. 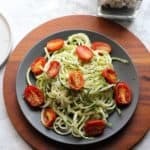 I love zucchini noodles so I can’t wait to try this out and enjoy them when they’re not so watery. That colander looks awesome! I love how little space it takes up in your sink! Your zucchini noodles look delicious! I struggled forever with zoodles making sauces too watery. Honestly, now I don’t cook my zoodles at all then just place the sauce on top of them to warm them up and it works great! I’ve heard that’s good! I don’t like them quite as crunchy but I bet it’s nice that you don’t have to worry about them being soggy! I am really loving zoodles! It’s the only thing I have used my spiralizer to do so far, but it’s more than worth the space in my cabinet. I have been trying to adjust recipes to account for the extra water in the zucchini, but I intend to add the salting, resting and straining to this as well! I haven’t had much luck cooking them in the oven, as they son’t Seem to get much drier. I notice that creamy sauces work better with zoodles, but it’s a real dietary trade-off. 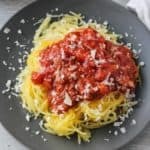 Do you think that making a tomato sauce super thick would balance out the watery nature of the noodles? I’ll have to try baking them! Thanks for stopping by! These are my kind of zoodles! So fresh and delicious!! I am so excited about this! I love zucchini noodles, but sometimes struggle with them turning out alright. Thank you! I’m kinda late to the party, I only recently got a spiralizer. But these are really great tips, and it looks so yummy! Thank you so much for the recipe! Thanks for sharing! Great dish! I had zucchini noodles for the first time last year and I have been hooked ever since. Great tips on preventing soggy noodles. Definitely trying this recipe soon! I can put my new spiralizer to good use! Oh this is so bright! I love zucchini! So. Much. YESSSS. 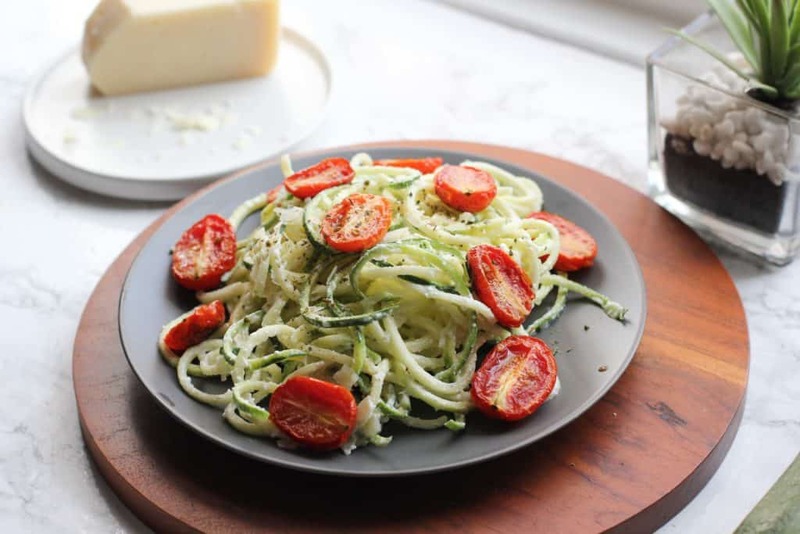 Loving these cheesy zucchini noodles like woah! So. Much. YESSSS. 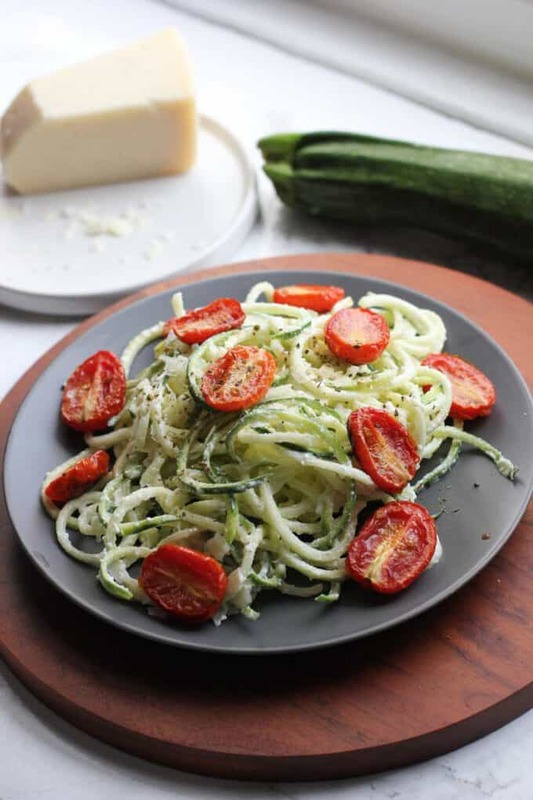 Loving these cheesy zucchini noodles like woah!!! I’m a big fan of zoodles. I’ll have to try coating the noodles with cheese then adding them to the sauce. I usually don’t even cook mine, just add them to the sauce in the last minute or two to warm up. I have tried the salt and drying them out and it works great. Thanks for the great tips! Zoodles are the best. 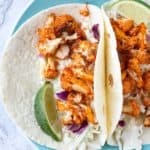 I loved this easy and delicious recipe! I love your step by step instructions…zoodles are so fun. Zoodles are my favorite substitute! Love the creaminess of this dish and the freshness! Thank you for some great tips!! Ps. I love that colander, that is so perfect for the sink!! Love zucchini noodles! This looks great! Yum! I love your tips on avoiding the zucchini noodles becoming soggy. This sounds perfect with that parmesan cheese.